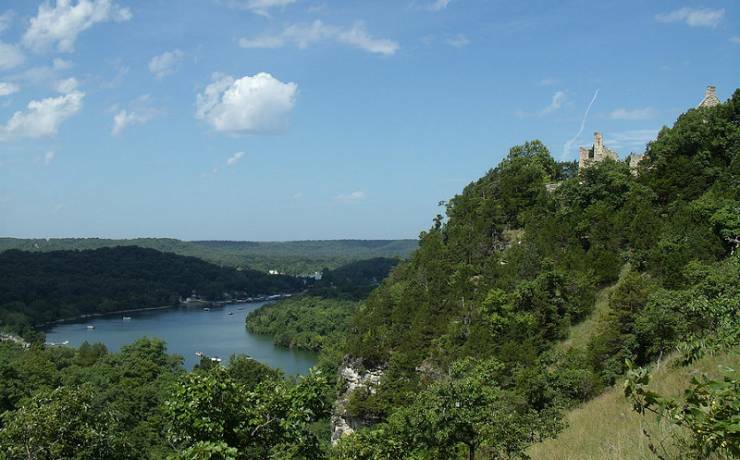 The Lake of the Ozarks boasts over 1,100 miles of shoreline and is an amazing place to take your family on a vacation. Even though I’m not a fan of commercial campgrounds, I was surprisingly happy staying at the Cross Creek Campground in the Lake of the Ozarks, as it had plenty of fun-filled activities for the family, just a stone’s throw away from our site. And you’ll discover this is very common for the area, making it a premier visitation destination. The center of every trip to the Lake of the Ozarks is, of course, the water. And in a place with more coastline than the entire state of California, there are plenty of water-based activities that you can partake in. For some adrenaline-inducing fun, opt for a jet ski rental or windsurfing. Other water fun includes fishing, kayaking, tubing and, of course, swimming. All across the Lake, there are dozens of tour operators and rental equipment companies that have everything you need for a peaceful lakeside evening or a fun day out in the water. Map out your water activities in advance, so you’re not scrambling at the last minute to put together an itinerary. Although most of the Ozarks activities are dominated by water, you can’t forget the area’s wide variety of pristine golf courses. And there are plenty of golf courses to choose from, from wooded courses to lakeside courses to professionally manicured, hilly courses. The majority of courses of are family-friendly, and no matter what your skill level is, you’ll appreciate the level of sophistication brought to life by some world-famous designers. A few high-rated courses include the Osage National Golf Resort, Old Kinderhook, Zoysia fairways at Bear Creek Valley Golf Club. Taking the family to visit the Bagnell Dam should be high on your to-do list. After all, it’s a modern engineering marvel built in 1931, and it’s what makes the Lake of the Ozarks possible. It was initially created to generate hydroelectric power, and when it was created, it officially made the Lake of the Ozarks one of the largest man made lakes in the world. This gives you the opportunity to teach your children a little more about the place they’re visiting. For instance, during the Great Depression, the Dam proved to be a beacon of light, as it provided thousands of people with much-needed work. Its original purpose was to provide electricity to the people of St. Louis. The Bridal Cave is definitely one of the prettiest caves we’ve ever visited. Its name derives from an Osage Native American legend which involved Conwee, the son of an Osage chief, who wanted to marry the daughter of the chief of a rival tribe. To date, over 3,000 weddings have taken place in the cave, but it’s much more than the site of a ceremony. In fact, every year, thousands of children visit the Bridal Cave as a part of an educational program, and it’s considered a must-see kid-friendly attraction at the Lake of the Ozarks. Not only is it steeped in history, but there’s plenty to see. The cavernous “Mystery Cave” is finally available to the public after it took two years to create a passable entry for people to view it themselves. It’s also considered one of the most scenic caves in America; it has more onyx formations than any other cave in the world, as well as giant columns, amazing mineral deposits, draperies, and soda straws (hollow mineral cylindrical tube that sprout from the roof of caves). Who doesn’t love a fun visit to the waterpark with the family? Beat the Missouri sun at Big Surf, a highly-rated waterpark that sits near the Lake of the Ozarks State Park. It features lazy rivers, raging rapids, and water rides suites for all age levels. Two of its notable features are its 375,000-gallon wave pool and its activity pool, which has an aquatic obstacle course that everyone can enjoy.